Point of View is a newly renovated modern contemporary South Sound villa that has been exquisitely designed to take in the surrounding untouched natural beauty. The gentle waters and soft sands of the private, kid-friendly beach are perfect for even the littlest bare feet. Expansive windows survey the pool and beach (and your loved ones). An outdoor kitchen, private dock with cabana, and breezy dining spaces bring resort-style comforts to your private Cayman getaway. And the infinity pools sun shelves and fire features encourage you to lounge poolside from sun-up to sun-down. Six bedrooms and six and a half bathrooms accommodate multiple families with ease. 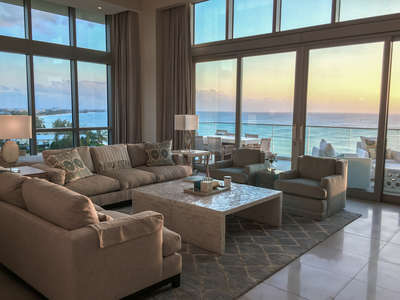 An oceanfront master suite with morning kitchen awaits one lucky couple, while a second master suite with sea and pool views and a marble and crystal bath is equally indulgent. Kids can pile into the 6-person bunk-room for a sleepover while other adults choose from three more well-appointed bedroom suites, all with their own baths. • Bath amenities (shampoos, conditioners, lotions and soaps). • Beach towels, Spa robes and slippers provided. • Keurig, Nespresso and built-in Miele espresso makers provided (with a starter kit of coffee pods, teas, sweeteners and cream). • Two security safes for valuables. • Game room and home theatre. • Telephone for local calls and Magic Jack for calls to Canada and the United States. • Heated infinity pool with sea view and fire pit. Two hot tubs and three foot deep child's pool. • Outdoor kitchen with propane grill, sink, fridge and ice maker. • Kayak and stand-up paddle board are available for guest use. • Pool and beach toys. • Dock with lights, power and speakers, swim ladder and boat cleats. • Housekeeping services (before arrival, after departure and mid-point for minimum five nights). • Private airport transfer and car services. • VIP airport fast track. • Massage and spa services (in-villa or outdoor spas). • Yoga and personal training. • Events allowed (contact a reservations manager for villa event policy). • Minimum age limit for renters is 24 years old. • Wheelchair inaccessible (we will attempt to assist or accommodate limited mobility guests if possible). Located in a prestigious neighborhood on the secluded south side of the island, our home offers you all the serenity of a secluded hideaway while remaining close to some of the area's most desirable attractions. A ten minute drive lands you in Seven Mile Beach, a pristine shoreline best enjoyed in a private cabana with beach side service (do not worry, we will book it for you). Or pack a cooler and head for the public beach for a more low-key day on the coral sands. On the way home, duck into one of several world-class restaurants. If nothing suits your palate in Seven Mile Beach, taste your way through Georgetown, a ten minute drive away, with a three hour walking tour along its waterfront eateries. With the airport just ten minutes away, it will not take long for you to make the transition from jet-lagged to toes-in-the-sand when you stay at this luxury villa.